Lace up because your entire family is invited to run or walk in support of Orca K-8 PTSA. 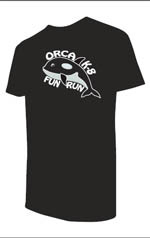 Formerly the Jogathon, the Orca K-8 Fun Run is a 5K family-friendly course at Seward Park. Everyone is welcome! Form a team of runners/walkers if you wish! Snacks and entertainment will be provided during and after the fun run. Fantastic prizes will be awarded for classes with most participation and greatest fundraising results! PCC will be on site with fresh and healthy snacking and Bent Burgers has offered a great prize for the top fundraisers! You should have received your Fundraising Packets, they were sent home the week of March 4. Donations will be collected just like the Jogathon. Start thinking of friends and relatives who may want to support our school! Our goal is to raise $10,000! Fun Run T-Shirt and Hoodie order forms have been sent home with the kids. Make sure to order a shirt for everyone on your Fun Run team! Additional order forms can be found in the Main Office or on the Orca website under “forms.” Orders and Payments are due Friday, March 8th. If you have questions or would like to volunteer please contact Becky at bhhamilton@gmail.com. All proceeds will benefit Orca K-8 PTSA General Fund with a percentage donated to the Orca K-8 Athletic Department. See you ALL in spandex on April 6!